Users receive an IP address from a DHCP Server. DHCP Server and DNS server are located behind the Security Gateway. A new IP address is assigned after user disconnects from a network and reconnects. 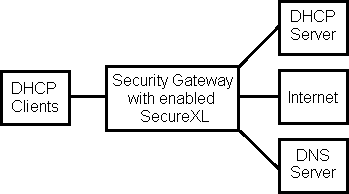 SecureXL is enabled on the Security Gateway. When user connects for the first time, access to web sites by their URLs works correctly. After user disconnects and reconnects for the second time, access to web sites by their URLs stops working intermittently. It is possible to access web sites only by their IP addresses. This issue does not occur for users, whose computers are configured with static IP addresses. Disabling SecureXL on the Security Gateway resolves the issue. SecureXL is using previously cached MAC address (associated with the involved IP address) for accelerated connections sent from Server to Client (in this case, packets sent from the DNS server to the Client). For F2F packets, the OS is aware that this IP-to-MAC address mapping is stale, so it sends an ARP Request for the IP address and updates the cache with the correct value. However when SecureXL queries for the MAC address, the ARP Request is not sent. As a result, SecureXL is using previously cached MAC address (associated with the involved IP address).